As well as Dubrovnik being the ideal holiday destination it is also a magnet for those who enjoy excellent food and the best wines that Croatia has to offer. The vineyards along the Adriatic coastline here produce some of the country’s finest and most famous wines, due to the high amount of annual sunlight hours and the perfect soil conditions. Dubrovnik offers a great choice of restaurants and local taverns offering authentic Dalmatian meals. Seafood plays a large role in the cuisine of the region and you will be able to enjoy all the fruits of the sea such as: octopus salad, black risotto, grilled fish, fresh oysters, mussels, grilled or fried squid, shrimps, fish stews with polenta (cornmeal) and shellfish. Also on offer are the local prosciutto ham, cheeses and succulent lamb. All of these dishes are made with the freshest local ingredients, and served with vegetables, all seasoned with local herbs such as rosemary, thyme, parsley, basil, bay leaves, sage and many more. 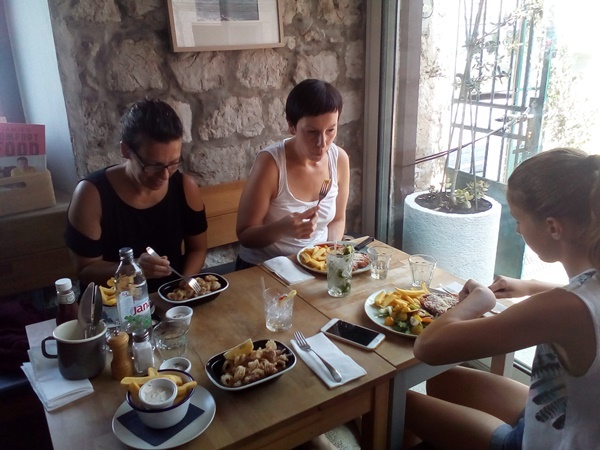 In recent years more quality restaurants have been opening in Dubrovnik, as well as modern restaurants that prepare the latest dishes in cooking. Nowadays you can also find several restaurants serving the cuisine of different cultures such as Japanese, Korean, Indian and Bosnian amongst many others. Such delicacies as shrimp pouches on roasted aubergines in coconut sauce, along with many sushi dishes, vegetarian, vegan and gluten-free food are now all on offer within Dubrovnik’s city walls. There is a wide choice. Everyone will find something that they can indulge themselves with. Many of the restaurants have open terraces on the city’s squares and some are even located in medieval palaces, bastions, towers and secluded courtyards. Most of the restaurants open at around noon and will stay open until midnight. You will be able to find the right place for your romantic dinner under the starlight sky with ease. North of the Old Town of Dubrovnik is the peninsula of Lapad where many excellent restaurants are situated amongst the tourist accommodation and hotels. Opposite Lapad is the neighbourhood of Gruz, along the quayside of which many cruise liners and ferries dock with traffic to and from Dubrovnik. In the past it was the retreat for Dubrovnik’s wealthiest people who had plush residences and mansions built here. Today it is mostly residential, it has a large open air market and it is also where the main bus station for Dubrovnik is located. Here too you will be able to enjoy the local cuisine in cosy, friendly restaurants away from the crowds of the Old Town. There are also a great number of restaurants in the area surrounding Dubrovnik: the Konavle region and its centre, the ancient town of Cavtat, the hilly peninsula of Peljesac, where the best grapes ripen on its rocky slopes, and the Elaphite Islands which are an archipelago northwest of Dubrovnik covered with evergreen Mediterranean vegetation with pristine beaches and untouched landscapes. All along the coast you will find small village restaurants offering local, fresh, healthy and tasty food cooked in traditional ways. Whatever and wherever you choose to eat to finish off any delicious meal why not try a glass of rakija – a fruit brandy, known in Italian as grappa and similar to the German drink schnapps, made with various local herbs, fruits and sometimes honey. And as you enjoy the culinary delights, the atmosphere and sights of Dubrovnik’s Old Town you may just catch a glimpse of the many world famous movie stars, celebrities, sportsmen and women, and musicians who choose Dubrovnik as their holiday destination all year round, dining in some of the exclusive restaurants and bars. "What's Cooking in Dubrovnik?" is a cookbook in English, written by Ana-Marija Bujić, an acclaimed Croatian food blogger. With more than 300 pages, and 120 recipes, this book is a guide to the way people in Dubrovnik eat and live today. All the recipes have been tried and tested and many of them are part of family heritage. The cookbook is available for order at a price of 250 HRK. Check out the preview of the book here.